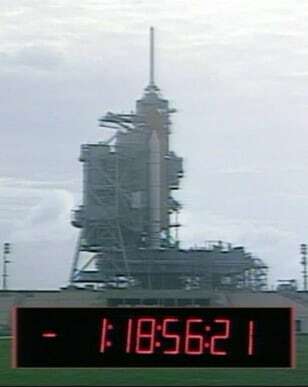 In this image from NASA TV, a virtual countdown clock is superimposed over a view of the shuttle launch pad. The clock shows one day, 18 hours, 56 minutes and 21 seconds. The time is less than the amount of time until the schedule liftoff, because of a series of built-in pauses that halt the countdown.